BAGHDAD, Iraq (CNN) -- Before the United States invaded Iraq in 2003, U.S. intelligence predicted many of the current challenges there, according to a Senate Intelligence Committee investigation report released Friday. Those predicted -- and realized -- problems included an increase in al Qaeda operations, sectarian violence within Iraq and Iran's efforts to shape Iraq's future after the ouster of Saddam Hussein. Intelligence analysts also predicted that establishing a stable democracy in Iraq would be a "long, difficult and probably turbulent challenge," the report said. Noting that prewar Iraq was a "deeply divided society," intelligence warned that Shiite reprisals for their oppression under Hussein's regime would be a "major concern to the Sunni elite and could erupt if not prevented by an occupying force," the report said. U.S. occupation of Iraq could lead to increased terror attacks and operations by al Qaeda, which was judged likely to seize the opportunity presented by the occupation, the intelligence community said, according to the report. In addition, the report said, a U.S. occupation of Iraq "probably would result in a surge of political Islam and increased funding for terrorist groups." Invading Iraq would provide an opportunity for Tehran to expand Iranian influence as well, the intelligence community said, and Iranian leaders might "try to influence the shape of post-Saddam Iraq to preserve Iranian security and demonstrate that Iran is an important regional actor," the report said. Committee Democrats said the Bush administration's refusal to heed the warnings has led to "tragic consequences." "The committee is unable to answer the question as to whether the president personally was presented with the intelligence community's informed judgments about the factors that could prevent success from being achieved in Iraq," said the Democratic response, signed by committee chairman Sen. Jay Rockefeller of West Virginia and two others. "What can be said with greater certainty is that these prewar cautions were marginalized, if not ignored, by an administration set on going to war." But Republican members of the committee said the investigation had become "too embroiled in politics and partisanship" to deliver an "accurate and meaningful report that both sides could support." They accused Democrats of "cherry-picking" information for political gain. It pointed out the intelligence community's assessments on post-war Iraq were only one tool available to policy makers and military planners before the Iraq war. The report appears "to be aimed at assaulting the current administration," the Republican members said. Two other Republicans on the committee, however -- Sens. Olympia Snowe of Maine and Chuck Hagel of Nebraska -- supported the conclusions of Democrats. During a news conference Thursday, President Bush stood by his decision to enter the war. "Going into Iraq, we were warned about a lot of things, some of which happened, some of which didn't happen," Bush said. "And, obviously, I made a decision as consequential as that, I weighed the risks and rewards of any decision. "I firmly believe the world is better off without Saddam Hussein in power," Bush said. "I know the Iraqis are better off without Saddam Hussein in power. I think America is safer without Saddam Hussein in power." Meanwhile, anti-American cleric Muqtada al-Sadr, making his first public appearance in four months, on Friday ordered his Mehdi Army militia not to fight with Iraqi police and army forces. "From time to time, we hear of clashes between our brothers in the Mehdi Army and the brothers in the Iraqi police and army," al-Sadr said in a sermon at a mosque in the Shiite holy city of Kufa, south of Baghdad. Calling the message a fatwa -- a religious legal ruling -- al-Sadr said that "any fighting between the brothers is not allowed and [is] forbidden as long as they follow the good and reject the wrong. I advise the dear brothers in the Mehdi Army to resort to peaceful choices if they are attacked by the weak souls." Al-Sadr, thought to have been in Iran since February, reached out to Sunnis, who have been locked in sectarian struggles with Shiites in Iraq. "From here, I specifically mention the Sunni brothers. 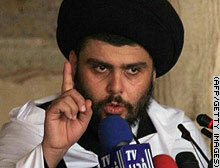 It is the occupier who came between us and divided us from them to weaken the Iraqi people." U.S. military spokesman Maj. Gen. William Caldwell said the military hopes al-Sadr's "return will contribute to the ongoing dialogue we've already established and had going on now for several months with Shia groups here in Iraq." In southern Iraq, "a prominent member of the militant arm" of al-Sadr's Mehdi Army was killed Friday by Iraqi special operations forces in Basra, the British military said. The forces targeted and killed Wissam Abu Qadir, who resisted arrest, in the Hay al Antiza district of the predominantly Shiite city, the British military said. It said Qadir was a top criminal leader involved in "weapons trafficking, theft and assassinations." Three U.S. troops died Friday in Iraq, including one soldier killed by an improvised bomb in the same area south of Baghdad where the search for two missing U.S. soldiers is centered, the U.S. military said. An improvised explosive device detonated at about 6:30 p.m. Friday in Mahmoudiya, killing the soldier, the military said. Another U.S. soldier, assigned to Task Force Lightning, died of wounds from small arms fire during an operation Friday in the Baghdad province and another soldier was wounded. A U.S. Marine was killed Friday in a non-combat related incident in Anbar province, the military said. At least 14 people were killed in attacks and 20 dead bodies were found Friday in Iraq, officials said. Gunmen struck a Shiite village north of Baquba, killing eight men and wounding six, a Diyala province security official said. At least five civilians were killed in mortar attacks in two Baghdad neighborhoods, an Iraqi Interior Ministry official said. Five U.S. soldiers were killed Thursday in separate incidents across Iraq, the military said. The death of a sixth soldier, who died Tuesday, also was announced. An Iraqi interpreter was also killed. Since the start of the war, 3,444 U.S. military personnel have died in Iraq. Seven civilian contractors of the Defense Department have also been killed in the war. The death toll for May is 93. CNN's Arwa Damon, Jomana Karadsheh and Paula Hancocks contributed to this report. Shiite cleric Muqtada al-Sadr gives a sermon Friday at a mosque in Kufa, Iraq, in his first public appearance since February. TIME.com: Al Qaeda on the run?